We return to Wright's Writing Corner today with a lovely guest blog by fellow author Cora Blu, who also writes Contemporary Romance as Olivia Lavyn. Her novel has recently become available. (1)Can you tell us a little about yourself? Where did you grow up? Where do you live now? First let me thank you for having me and allowing me this opportunity. Welcome back, by the way. I grew up in the beautiful state of Michigan where I still reside with my husband of twenty three years and three daughters. (2)What drew you to writing? Have you always wanted to write? Or did the desire come upon you more recently? A number of things drew me to write. As the sixth child out of seven, I was very shy and lived with a house full of characters at various stages of life. My mother would decorate my younger sister’s and my room in themes. There were rainbows that would go from one bed up the curtain down to the next bed or Holly Hobby, where we wore themed pj’s. My imagination stayed ignited. We sat at my father’s feet while he told riddles and brainteasers and stories constantly. The only how you knew if the stories were real or made up, was by the look my mother gave him. We’d watch Kennedy at the movies in the afternoon and I developed a love of deeply emotional movies and weird creative creatures from the B-movie era. My fourth grade teacher, Mrs. Beynon, and sixth grade science teacher, Mr. Pato, were great at encouraging my creativity. Have I always wanted to write? I think so. I come from a large family, both immediate and extended and so my stories tend to have the element of family, but the mature content of an adult read. (3)What types of stories do you like to write? Growing up the majority of my friends were of different races or ethnic backgrounds, so I enjoy writing interracial stories. It wasn’t until I began to read romance novels that I realized the rest of the world didn’t know it was okay to socialize and date outside of your ethnic background. I think it’s weird to say I write interracial when I write about people. (4)I notice that you write in more than one genre. Is this difficult? What challenges or advantages does this bring you? I write Contemporary Romance under, Olivia Lavyn and Paranormal Romance under, Cora Blu. Yes writing in different genres does pose certain problems. In my paranormal, of which I like the term fantasy better, my shifters have certain qualities that humans do not. My love scenes are very sensual and I have to remember not to have my Contemporary h/h do humanly impossible things that the fantasy h/h is better equipped to handle. Writing about tiger sharks and placing them in places they don’t normally frequent I had to explain why they were there. Something I learned through writing alongside other writers…everyone has an opinion. Stay true to the story you’re creating. Many suggestions although well intended can sway the direction of your story and you find it begins to resemble their story telling style and no longer your voice. I write romance; no matter the column it sits under it is a story of the emotional relationship of two people. Creating a world that is believable and still hold on to the fantasy aspect is difficult. My hero is seven feet tall with an old world accent he’s trying to curb for the teenagers in his clan, so it’s a challenge to not let him slip into modern slang. (5)How does what you write compare with what you like to read? I love regency, but based on reality there will never be an African American heroine, so it’s hard to place yourself in the story. I love a story with good family connections ( Prospero…) so I opt for Contemporary or fantasy because anything goes as far as who the h/h can be. (6)What are some of your favorite writers/books? Amanda Quick/ Jane Ann Krantz, for her naive yet inquisitive heroine’s. She was the person that pushed me to write formally. She encouraged me to join the RWA and said I would meet some of the most helpful people I could ever meet and she was correct. (7)You and I met in Margie Lawson’s class. Did you find the class helpful? Did you learn anything that could be shared with the rest of us? Yes, Margie’s classes were a challenge. I find when I divert from those teachings my writing lays flat. The one thing I would share that we learned is READ YOUR WORK OUT LOUD. In your head, the last letter of the previous word does not linger in the air. Out loud some letters stay in the air or in your ear while the next letter is being said, thereby killing the flow of your sentence—cadence is sacrificed. (8)Can you tell us a little about your projects? Book I ends with shark finning and polar bear poaching (not a spoiler). In book II, the heroine, Miyuki Takahashi, Pacific ocean rescue mission operator, will need to help the king remember they are life mates after he loses his memories of her following an accident. Debris and leaking fuel from Japan’s March earthquake is sinking to the ocean floor, trapping and hurting shifters between the Sea of Japan to the Midway Islands in Hawaii. The kicker is Blade is the boy that bullied her through high school and now helping him remember their worst time is the only way to bring his memories back, when they discover a connection between missing shifters and the legal finning of sharks in China. (9)Can you tell us about what you have coming out and how it came to be published? I am self-publishing and it’s a bit scary. It is available on Amazon and AllRomance.com tight now. I decided to go the self-publishing route because query feedback became the same. Great story, but water stories are hard to sell to Publishing houses and people have a hard time believing in a romance between humans and water people. 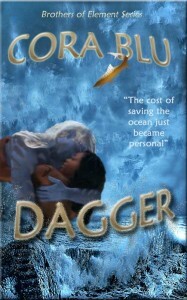 Dagger / Brothers of Element Series. Six tiger shark brothers have the responsibility to keep the ocean from boiling over and the earth from burning up by protecting their source of shifting from dying. Clear Coral was created out of love between the earth’s heated core and sand and seawater. Clear Coral absorbs excess heat and turns it into a gas that allows the larger fish and mammals to shift form. Now Clear Coral has stopped growing and unless the brothers can find their perfect mate and feed the Coral, share the mate’s DNA, she will die leaving the earth to absorb this excess heat and consume the earth, hence the reason behind the tsunamis and earthquakes, etc. that the world is experiencing now. Each brother receives a memory of a little girl that will grow to become their mate. Dagger, our hero, his mate is human. He has twelve days to convince her to fall in love and live beneath the ocean with him. Drew Hamilton lost her loved ones to the sea and now as an adult and marine biologist she has a love for all things marine. They have become like family to her. When the tiger shark she’s been talking to on the beach at night, not that she knew he could hear her, comes to her as a man can she accept what he’s telling her and go below the sea and live with him as his mate and save the land from being overrun by the ocean? Or will her suspicions of him possibly being the shark that killed her fiancé eight months prior, be the fuel she uses to accept his offer only to deny the Coral and watch his family die? Thank you again, Jagi, and congratulations on your third and last book in the Prospero series.